Sam Smith goes through some of the most trending topics around Bulls' players for the upcoming season. The Bulls this season are going to try to win; they’re not likely to have much success. Which is all the more reason why this could be a very interesting ansd compelling season. It’s basically a roster on an 82-game tryout. So what do people do when they don’t have any guarantees and their jobs are at risk? They work much harder and take it as seriously as possible. It will be clear which ones do not. The only Bulls player on this season’s roster with a lomg term multi-year contract is Cristiano Felicio, and his salary is about equal to the reasonable mid level exception. Robin Lopez and Justin Holiday are on two-year deals and pretty much everyone else is playing out rookie and below league average contracts. It’s part of the long term plan to be able to take on a better player if a team is looking to reduce salary. So if the Bulls are not likely to be contending for even a playoff spot in the weak Eastern Conference this season, they should be playing hard, working intensely and not giving up or giving in with so many futures at stake. Now they just have to combine that with more talent. Which is the goal for the next few seasons, or perhaps less, as the Bulls embark on the stormy seas of rebuilding with media day and the opening of training camp Monday in the Advocate Center. Perhaps they can’t see land yet, but now we get to find out who deserves to be on the crew. The future Hall of Famer and NBA good guy is the brontosaurus in the room. I’ll try to limit my extinction references hereafter. Wade is being mentioned the most often entering the season. Though he’s toward the bottom of the list of priorities moving forward. He’s obviously not part of the team’s future going on 36 this season and finishing up his contract at a team high $23.8 million. Wade opted in to his second season before the Jimmy Butler trade even as it was obvious to all that the Bulls were about to change direction from potential contender to trainee. Wade has indicated he left Miami for more money, so he obviously declared himself committed to taking the money and running compared with leaving for a contender. There’s been speculation about a potential buyout, though would Wade give up money? And how much? The Bulls say he hasn’t brought it up. But it’s probably not even beneficial to the Bulls, at least financially, to agree to a buyout. They get basically nothing back since they are so far under the salary cap with no long term major deals that they’d just have to donate the money saved to the players’ association. At this point, the Bulls probably don’t know enough about their players to pay someone a big contract. Plus, it would seem several teams will be trying to shed contracts this season for salary cap room with so many potential top free agents, like LeBron James, Paul George and Russell Westbrook. Maybe the Bulls get a first round pick to take one of those contracts in exchange for Wade? So why let him go so quickly? But then how do you fit him in with a young team which is being trained to run more and play at a faster tempo and leave everything and everyone behind? Wade’s a little like the senior citizen driving 55 in the left lane. It’s reasonable and gets you there, but everyone is whooshing by him. He still likely can score in the half court, and the Bulls don’t seem to have many scoring options, especially with Zach LaVine still in rehabilitation. Maybe two-way G-league player Antonio Blakeney, eventually. Which is the definition of a lack of major scoring options for now. But would it be worth it to let Wade take valuable minutes from a young player when Wade’s not in the long term plans. It was a last gasp last season for the Bulls in signing Wade, one more run to also accommodate Butler, who wanted veterans. So Wade and Rondo were added. But then Rondo gets hurt and the Bulls with Butler and Wade can’t beat Boston once with three at home? Wade averaged a career playoff low 15 points despite playing 32 minutes on 37 percent shooting. So it was time. Bench Wade? Is that appropriate for such a celebrated veteran? Wade will handle himself professionally. He always does. But do the kids defer to him because of his reputation and status and then become limited and tentative? The Bulls cannot afford that with their status. 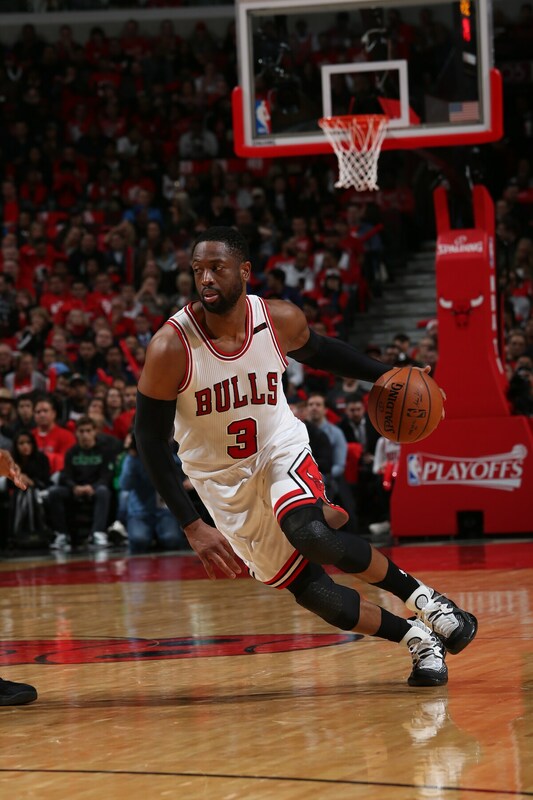 It’s unlikely Wade finishes the season with the Bulls. For how long and in what form will remain questions as long as he’s on the roster. The Wade bobblehead is January 13, by the way. Does he make it? Could be a collector’s item. Get your tickets now. So what about LaVine’s health? One of the big three of the Butler trade looks to be the most talented player on the roster. But he’s still not playing basketball after ACL surgery last February. He’s the usual “ahead of schedule.” But given the team history with Derrick Rose and his ACL surgery and questions about when Rose would return, which went a long way from alienating Rose from the community, it would be a surprise if LaVine were playing before Christmas. And it wouldn’t be surprising not to see him until close to All-Star break. The history of these tears is it usually takes about a year to get back on the court going full speed. LaVine likely steps in at starting shooting guard when he’s ready. The league’s most exciting dunker will be a welcome sight. Is Kris Dunn the guy the Bulls coveted in the 2016 draft or the low scoring reserve for the Timberwolves? Though LaVine probably is being eyed as a future face of the franchise and Lauri Markkanen has flashed possibilities, the key to the trade may be unlocking Dunn’s potential. He seemed to regress as a rookie from a fearless penetrator to a cautious dribbler under the demanding Tom Thibodeau. Which is the real Dunn? Point guard is the most important position in the NBA these days, and while the physical Dunn looks like he can defend, point guards need to score and finish at the basket. Dunn’s shooting has been questioned, and if you cannot be a threat it’s difficult to get to the basket and open space for teammates. Derrick Rose did so, but with uncanny, rarely seen speed and explosion. Dunn’s not that kind of player. He’s basically starting again, and the Bulls are counting on him taking over and going back to his future. Yes, but not really. The Bulls were hoping Cameron Payne would be pain free, but he’s back to surgery. Jerian Grant supposedly has had a good summer and has been one of the better shooters, through streaky. Can he also be a playmaker? Free agent NCAA hero Ryan Arcidiacono has a lot of the elements needed with the ability to run a team and make threes, but he’s not quite the athlete to match the position in the NBA. Denzel Valentine can do some ballhandling; so can Wade and eventually LaVine. But it’s on Dunn for now. This season coach Fred Hoiberg will likely implement more of that so called pace-and-space game. Does he have the guys to shoot with the space and the guards to provide the pace? Nikola Mirotic is finding out, like a lot of players (see Nerlens Noel), he misjudged the market. The salary cap didn’t go up nearly as much as was expected, and teams pulled back from the notorious spending of the summer of 2016 when the cap first swelled dramatically. So there were no other substantial offers. Now the larger question with the strong summer for Markkanen is where Mirotic fits. The Bulls want to--and should—finally give Bobby Portis a chance to see if he’s a keeper. He’s really never had one and for the second straight season he has impressed as the team’s most committed worker. Doesn’t he deserve a chance? Rookie Markkanen has shown he’s ready for some steady minutes now and that there’s no reason to let him mostly watch for a season. The Bulls don’t have to decide on him right away, but they have to begin determining what kind of team they will be and establish a talent identity. And whom to pay. The kids have to play to see where they fit. Mirotic returns, but where does he play? Should he? That makes three power forwards who need minutes. That should be one of the good questions for Doug Collins. Anyone else trying to catch on? There’s David Nwaba, a 6-4 defensive oriented guard picked up after spending time with the Lakers trying to make the team along with Quincy Pondexter, a small forward acquired for the extra draft pick. He’s healthy now and will get a look in camp, but hasn’t played in two years with knee problems. That’s also what training camp is for. Obviously, Wade is the blue whale in that lineup. Dunn figures to start at point guard with Robin Lopez at center. Lopez is one of those great teammate types, buys in to whatever the team wants and is one of the better mid range shooting centers in the league. So you can run a flow offense with him in this era of the disappearing center. But with just two years on his deal, Lopez could also prove valuable to a contender and yield the Bulls a draft pick in trade. Perhaps toward the new trading deadline before the All-Star break. The Bulls have Felicio for four years and are taking a look at free agent center Diamond Stone. Style wise the Bulls also could experiment with Markkanen at center, which would open time for Mirotic. But Markkanen is still physically undeveloped. So Dunn and Lopez. Wade at shooting guard? Probably, but the Bulls could opt to bring Wade off the bench and start a more athletic, young team. That might mean Justin Holiday, the former Bull and free agent from the Knicks, at shooting guard. Then maybe Denzel Valentine or Paul Zipser at small forward with Portis or Mirotic at power forward. If Wade starts, then probably Holiday at small forward since he’s the more athletic one and has an improving shot. For now, say maybe Dunn, Wade, Holiday, Portis and Lopez. Yikes. So how many wins is that?